Detergent surfactants were developed in response to a shortage of animal and vegetable fats and oils during World War I and World War II. In addition, a substance that was resistant to hard water was needed to make cleaning more effective. Today, detergent surfactants are made from a variety of petrochemicals (derived from petroleum) and/or oleochemicals (derived from fats and oils). As in soap making, an alkali is used to make detergent surfactants. Sodium and potassium hydroxide are the most common alkalis. Detergents are commonly available as powders or concentrated solutions. They are amphiphilic: partly hydrophilic (polar) and partly hydrophobic (non-polar). 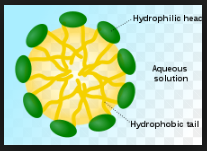 Their dual nature facilitates the mixture of hydrophobic compounds (like oil and grease) with water. Because air is not hydrophilic, detergents are also foaming agents to varying degrees. Detergents are classified into three broad groupings, depending on the electrical charge of the surfactants : ANIONIC, CATIONIC AND NON-IONIC.